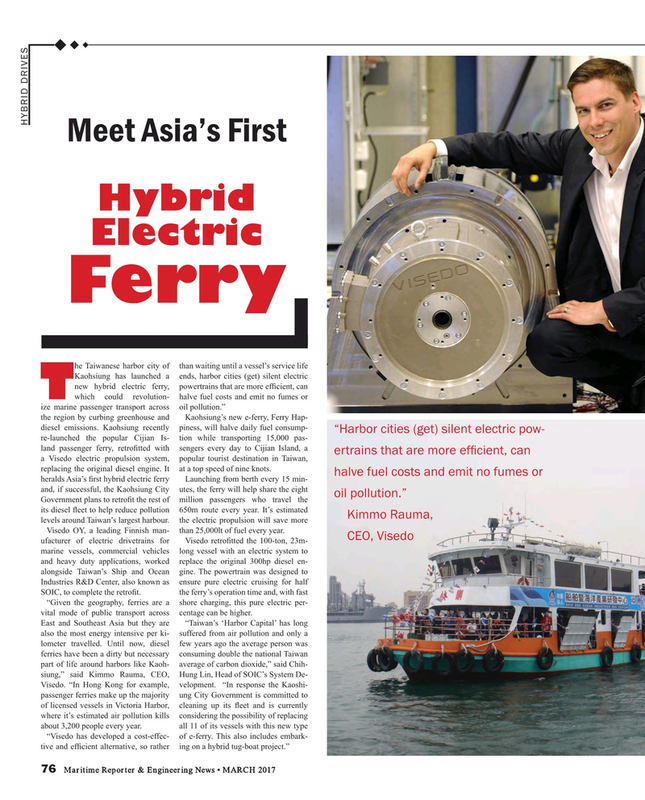 Twhich could revolution- halve fuel costs and emit no fumes or ize marine passenger transport across oil pollution.” the region by curbing greenhouse and Kaohsiung’s new e-ferry, Ferry Hap- diesel emissions. Kaohsiung recently piness, will halve daily fuel consump- “Harbor cities (get) silent electric pow- re-launched the popular Cijian Is- tion while transporting 15,000 pas- land passenger ferry, retro? tted with sengers every day to Cijian Island, a ertrains that are more ef? cient, can a Visedo electric propulsion system, popular tourist destination in Taiwan, replacing the original diesel engine. It at a top speed of nine knots. Visedo OY, a leading Finnish man- than 25,000lt of fuel every year. SOIC, to complete the retro? t. the ferry’s operation time and, with fast “Given the geography, ferries are a shore charging, this pure electric per- vital mode of public transport across centage can be higher.